Tuesday morning will start clear then a cold front will hit all of Colorado by midday with snow starting then and ending by about Tuesday at midnight. Expect 3-6 inches in the northern and central mountains with much lighter amounts in the south. The next storm should bring snow from Thursday night through Saturday, and the updated model runs show this storm coming in a little further south, which throws more uncertainty into the forecast. 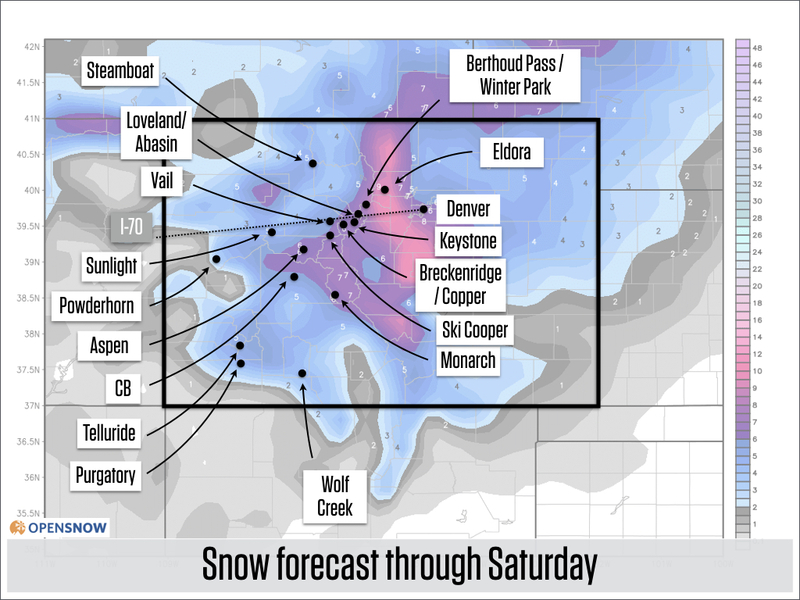 However, it still looks like Saturday should be a powder day for many mountains. On Tuesday morning, the skies are clear, the temperature is warm, and we are waiting for the cold front to arrive. Here are the resorts that are still spinning their lifts, as well as the dates that they are planning to close. The cold front has already hit Utah and is on its way to Colorado. Expect the front to pass and showers to form starting late in the morning for areas further west (Steamboat, Powderhorn) and then around noon for most other mountains. We’ll see snow showers from about Tuesday midday through about Tuesday at midnight. This is a strong storm with lots of energy, however, it will not bring a lot of moisture, and that will be the limiting factor for snow accumulations. I’ll stick with my 3-6 inch forecast for the northern and north-central mountains, though with the storm’s strength, perhaps one or two areas will eke out amounts that are a bit higher. Below is the snow forecast for this storm. The timing of the best powder hasn’t changed – target Tuesday afternoon or more likely first run on Wednesday morning to find the softest snow. Also, dress warmly as temperatures will plummet into the teens and low 20s on Tuesday afternoon, and should start the day in the single digits to low teens on Wednesday morning. 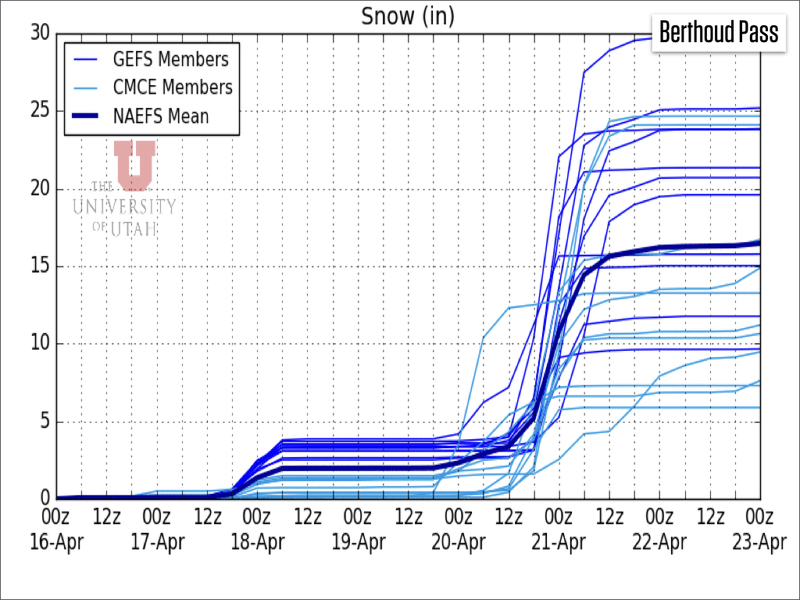 Even when most models agree, the forecast still evolves! The latest models now show that the storm will move a little further south compared to previous forecasts. My guess is that this forecast will continue to adjust, but in the meantime, if we believe these latest models and the storm does drop a bit further south, here’s what that could mean. * Thursday night and Friday would bring spotty and potentially intense snow showers to all mountains, with a snow level around 8,000-9,000 feet. * Friday night into Saturday morning would favor the areas near and east of the continental divide with a snow level around 7,000 feet for this area. * The deepest powder will be found on Saturday morning in the north-east mountains, though depending on what happens on Friday with the spotty yet intense showers, we could see some pow on Friday afternoon as well. The forecast below is from multiple versions of the European model, made on Sunday night. I showed this yesterday. Snowfall favors areas near and east of the divide. The forecast below is from multiple versions of the European model, made on Monday night. 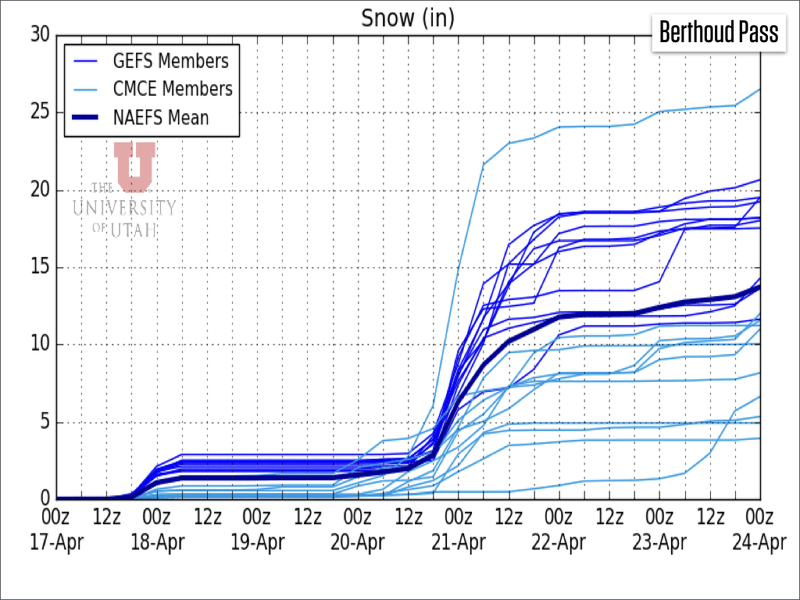 Notice how the deeper snow totals have moved west and south, now favoring much of Colorado. It’s frustrating to see the average of multiple models change so much in 24 hours because we use the average of these multiple scenarios to smooth out the forecast and try to avoid flip-flopping from model run to model run. Let’s look at another set of scenarios. 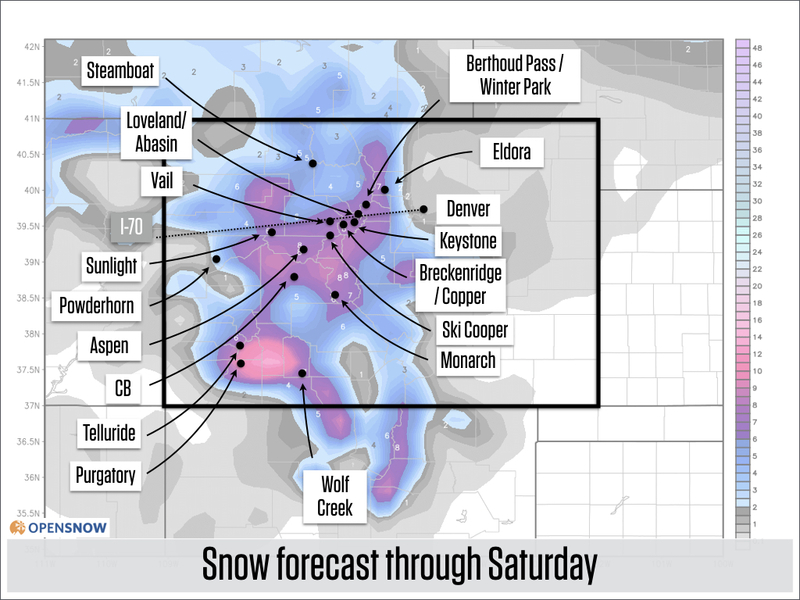 The forecast below is from multiple versions fo the American GFS and Canadian models, for Berthoud Pass, made on Sunday night. I showed this yesterday. The snow forecast averages about 15 inches. 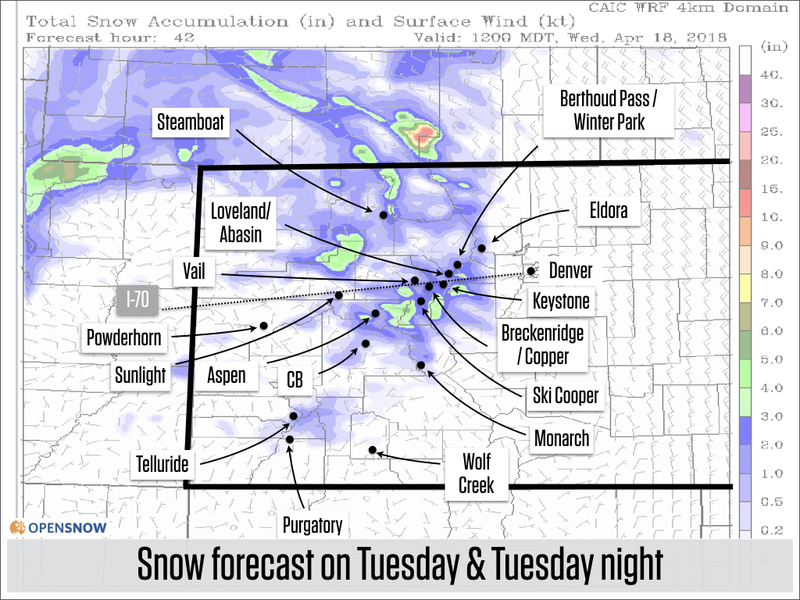 The forecast below is from multiple versions fo the American GFS and Canadian models, for Berthoud Pass, made on Monday night. The snow forecast averages about 10 inches. The takeaway from all of this is that we’re still expecting a storm from Thursday night to Saturday, and due to the amount of moisture that the storm will push into Colorado, snow totals should be significant with 6-24 inches across the state. Exactly which mountains get the deepest snow is now less certain than yesterday, but I’d still target Friday afternoon or more likely Saturday morning for the deepest powder. After the likely powder on Saturday morning, I am not seeing any other cold, strong storms during the following week. We could see something around Tuesday, April 24th, but other than that, it appears that the atmosphere might relax for at least a little while.